Or the time he pointed me toward steak “for swissing” to use in a stir fry steak recipe. Already cut, and the cheapest steak in the case, too. 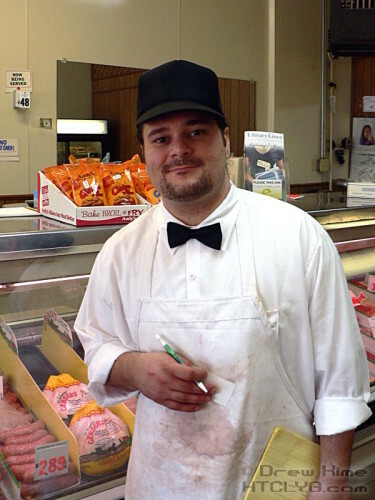 Or when I was making steak kabobs, and Larry just asked, “For how many people?” I told him, and he cut it all for me. So you can imagine I wasn’t real happy a few weeks ago when I heard he was retiring. He’s been there for 40 years, and it was time to stop working so hard. He deserves it, but the whole neighborhood was going to be sorry to see him go. Then we heard a rumor that Josh was going to be taking over. He was a young guy who had been working for Larry for a couple of years. And the rumors were true. Josh grew up in Euclid, (that’s where we are) graduated from Euclid High School, and started cutting meat at Holzheimer’s when he was 15. Worked there until they closed, then came to work for Larry. The day Larry told his staff that he was retiring, Josh told him, “I want it.” It took a few weeks to work out the details, but Josh re-opened the store this week. At 27, he could be there for the next 40 years. Do you remember what you were doing at 27? Were you running your own store, with your own employees, and a whole neighborhood counting on you? I sure wasn’t. Larry still comes in every now and then to help with the paperwork, and teach the new guys how to cut so Josh doesn’t have to do it all. That’s why everyone loved Larry: He cares about his customers and wants to take care of them, even now that he doesn’t have to. 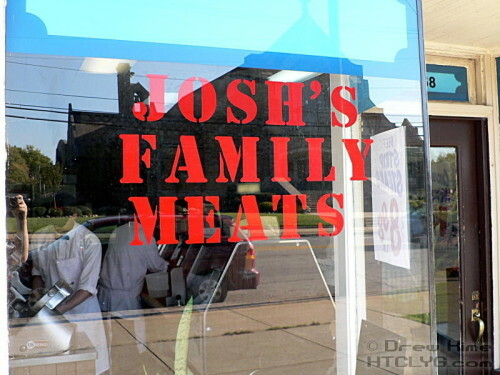 Ross’ Meat Market is now Josh’s Family Meats. Look close through the glare and you can see Mike (a new guy Josh brought in) is wearing the same uniform as Josh. Walk in there and you’ll think you stepped back in time. 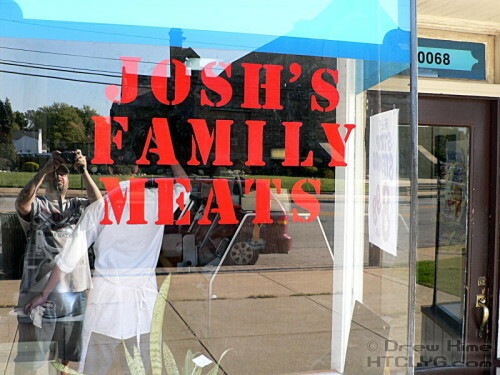 I have a feeling you’ll be reading more about Josh in the coming months. This has nothing to do with Larry or Josh, I just like this other picture. Oops. Who’s that in the reflection?